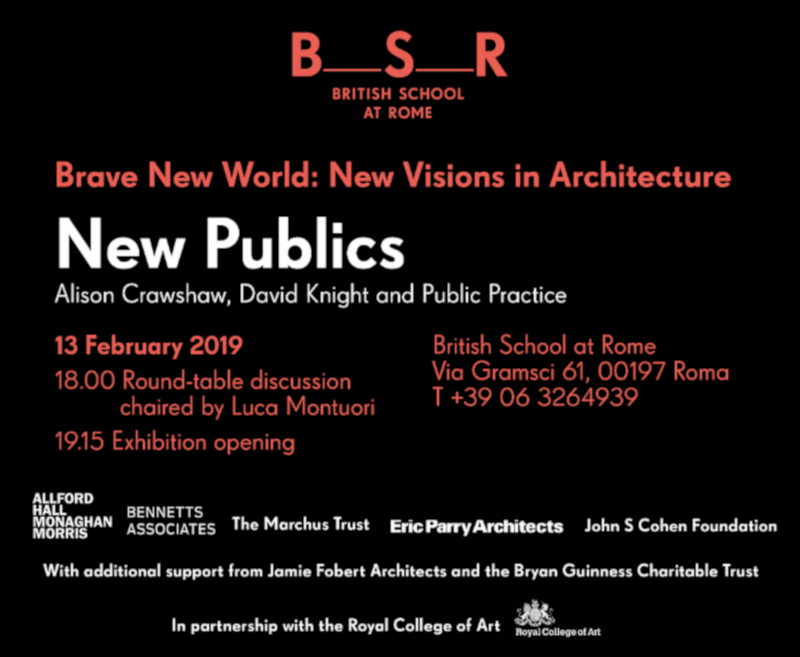 On Wednesday 13 February, the exhibition New Publics curated by Alison Crawshaw, David Knight and Public Practice, will open at the British School at Rome, following a round table discussion. This is the fourth event in Brave New World that seeks to investigate the changes in the role of the architect today as well as question whether younger designers are driven by a renewed social consciousness and more utopian ideal of what can be done by design. Nowhere are these themes more clearly illustrated than in this event New Publics. The 2008 financial crisis ushered in a decade of austerity and deregulation that reshaped the role of the state in Britain and in turn reshaped the public life of our cities. The generation of architects who started their careers under these conditions are increasingly stepping across sectors and beyond traditional roles to build new forms of publicness. Alison Crawshaw, DK-CM and Public Practice are three emerging British practices leading the construction of these New Publics. They pursue a public agenda from different positions within, and beyond the planning system. The three projects will be presented through a series of films, manifestos, photographs and documents. Alison Crawshaw’s study The Politics Of Bricolage surveys abusivismo edilizio (unlawful building) in Rome. In Valle de Borghesiana, an outlying self-built neighbourhood of the city, she worked with local residents and with the architect Antonella Perin to convert a derelict building into a meeting room for the development of neighbourhood plans. The works were undertaken with planning permission. On display: Two films: Flight Over The Toponimi, a film of a helicopter flight over the latest zones of illegal building in Rome, and Il Spazio D’Incontro that documents the construction of a meeting room for local planning within one of these neighbourhoods. DK-CM’s research project Making Planning Popular transfers knowledge about planning from the hands of politicians and developers to the layman through an on-line tool, Building Rights, which will use forums, on-line mapping and GIS tools to provide a live public forum for planning discourse. On display: a series of filmed interviews with members of the British public discussing their engagement with the statutory planning system. The interviews, conducted online, will explore popular attitudes to public planning and suggest how statutory planning might benefit from opening up to this wider culture of spatial practice. Public Practice is a social enterprise founded by Finn Williams and Pooja Agrawal that places a new generation of architects, urbanists and planners within local government to improve the quality, and equality, of everyday places. Their first cohort of Associates are using design to help change the processes, policies and culture of public planning. On display: a documentary film that follows the first ever cohort of Associates, exploring their new roles within the public sector, the challenges they face, the changes they make and the lessons they learn. A series of photographs by Timothy Chase will present the council offices, civic centres and town halls they work in. A roundtable discussion featuring all three practices will be chaired by Luca Montuori, Professor of Urban Design at Roma Tre University and Assessore all’ Urbanistica at the Comune di Roma (Director of Town Planning at Rome City Council). Montuori is also the founder and director of the practice 2tr. Montuori, together with Marco Provinciali from the young Italian practice Supervoid, will also draw comparisons to the state of public planning in Italy today. Public Practice is a not-for-profit social enterprise founded in 2017 by Finn Williams and Pooja Agrawal. They recruit outstanding built environment experts for year-long placements within progressive planning authorities. Finn studied architecture and worked for OMA in Rotterdam before nine years in the public sector at Croydon Council and the Greater London Authority. He is a Visiting Professor at the UCL Institute of Innovation & Public Purpose and was co-curator of the British Pavilion at the 2016 Venice Architecture Biennale. Pooja worked at Publica and We Made That before joining the Greater London Authority, where she oversees strategy, policy and projects in North West London. She is a trustee of the Museum of Architecture, a mentor at the Stephen Lawrence Trust and an advocate for diversity in the built environment sector. Luca Montuori is an architect and since 2017, Deputy Mayor for Urban Planning at Rome City Council. Associate Professor of Urban design at Roma Tre University, he founded his practice 2tr architecture together with Riccardo Petrachi in 2000. A former member of the scientific committee of the Casa dell’Architettura in Rome (2007-2017), Montuori has organized various events, talks, and exhibitions, including the Biennale dello Spazio Pubblico in Roma (2011 and 2013). Supervoid Architects: Marco Provinciali and Benjamin Gallegos Gabilondo are co-founders of Supervoid, an architecture practice based in Rome. Supervoid has produced a range of diverse projects in Italy and the United States. It is currently working on a research project on the EU and architecture. As a practice based in Rome, a city that has been largely developed by the private sector, Supervoid deals with the constant negotiation between public and private interests. The practice aims to produce, by means of design, a meaningful synthesis between the two.